While we are very proud of the impact our tractor (Oggún), the Open System Manufacturing model, and our virtual enterprise business model can have on the global food supply issue, we realize that it addresses a symptom, not the underlying issues. Increased production only compounds the farm to table issues that exist in much of the world. To solve the global food supply issue, it would be best if we first address the underlying problems as many are more complicated and will take more time to put in place than the delivery of tractors and farm practices education. Together we have an opportunity to lead in the development of a regional farm to table process definition that can be applied on a global basis. We need only mirror the processes that have been defined for global food systems in support of local/regional food systems. This entails the definition of product movement from farm to table with associated responsibilities at the local level. One of the basic tenets of leadership is to never ask someone to do something that you have not done yourself. With the market conditions that exist in the United States today, we have an excellent opportunity to put in place a regional farm to table distribution model that can be the starting point of a global solution. These market conditions would allow for a significant expansion of small farm operations. American consumers are demanding more information about their food, thus creating a significant market demand for local and organic food. Yet when a 10-acre diversified farmer grows vegetables he’s told that he should direct market his product. The intent may not be to limit the small farmer, but across the board this is what is happening, regardless of the programs that are in place. This is the real world view as has been told to us by farmers and university research farm managers. To solve this problem, we have to find a way to let the farmer stay in the field, not sit at a farmer’s market waiting for customers to walk by. This problem will not be solved by announcing another program to help small farmers fix a specific problem, e.g. loan to buy land, certification process for organic, etc. To solve this problem, we must understand the systems used by multinational agribusinesses which allow them to dominate the large farm agricultural space and then provide these services to small regional farmers. For more than a century, the people of Archer Daniels Midland Company (NYSE: ADM) have transformed crops into products that serve the vital needs of a growing world. Today, we’re one of the world’s largest agricultural processors and food ingredient providers, with more than 32,300 employees serving customers in more than 160 countries. With a global value chain that includes 428 crop procurement locations, 280 ingredient manufacturing facilities, 39 innovation centers and the world’s premier crop transportation network, we connect the harvest to the home, making products for food, animal feed, industrial and energy uses. Because ADM is one of the world’s leading agricultural processors, we’re able to serve thousands of customers efficiently and profitably. We operate the world’s premier crop origination and transportation network, connecting crops and markets in more than 75 countries. Our customers benefit from ADM’s unrivaled global reach, strong relationships with farmers, and extraordinary range of logistical, analytical and technological services. To build the regional food system that will allow the small farmer to succeed we need to implement some of the early USDA and land grant programs that get closer to the farmer and provide the assistance they need (“The People’s Department”). However, it is understood that we live in a different era, and these programs can only function in a modern society by utilizing technology. The technology exists for farmers and agents to be connected real time via mobile apps, for example. When you consider the diverse resources that can be brought together, solving the problem is not that complex. The USDA, universities, private industry and farmers working together for the benefit of the farmer will allow us to accomplish, on a regional basis, what private industry does globally. Some of the organizations that will play a key role are: Rural Development, NIFA, FSA, universities, Extension, state level farmers cooperatives, local and state government, NGO’s and technology companies. Given the leadership position of the USDA and the universities it would be best to start the project with an implementation plan at the state and regional level. A good way to start would be to select no more than three regions as pilot locations to work with as the process is developed. We know there is a demand for the concepts that we have outlined, we need only develop the team for implementation. We have talked with Alabama A&M about working on a regional project to determine the crops that will generate the highest margins. From there the systems that we outline below must be put in place to ensure small farmers (10 to 80 acres) that their products will reach the tables within the maximum possible range. 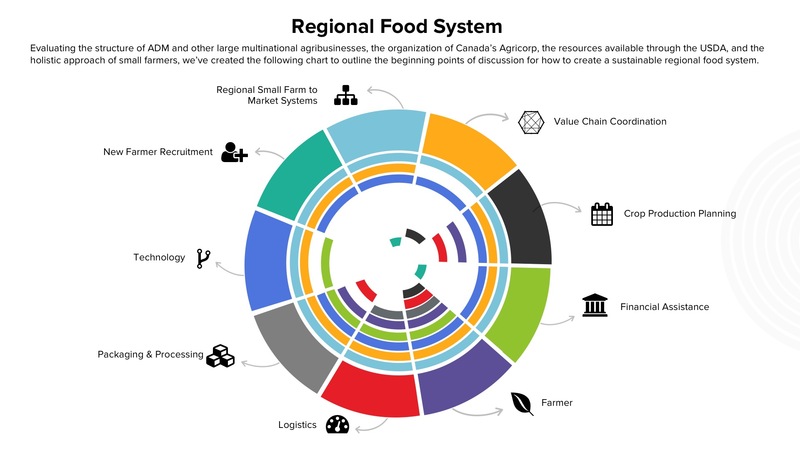 Evaluating the structure of ADM and other large multinational agribusinesses, the organization of Canada’s Agricorp, the resources available through the USDA, and the holistic approach of small farmers, we’ve created the following chart to outline the beginning points of discussion for how to create a sustainable regional food system. This team, with the USDA as the lead, is responsible for overall program direction and management. As such, it will have direct communications with everyone in the chain. This team is responsible for the rolling five-year plan. As such it interfaces to all groups. This team provides information to the farmer and value chain. This team provides support to the farmer and the private sector groups. Field to packaging and processing. Provide field equipment to farmer at harvest time. This team interfaces with packaging and processing, crop production planning, and the farmer. This team interfaces to logistics and farmer. This team interfaces with everyone. This function is connected to financial assistance and regional small farm to market systems team.